You may not have heard of Apps Foundry, but if you read content on your cellphone or tablet computer, you would probably have benefited from the company's services. The company is in the business of getting publishers of content - newspapers, magazines and even books - to make that content available on its mobile app, SCOOP. This app enables consumers to view the content on their mobile devices while on the go. Apps Foundry has emerged as a significant player in the sector. It has about 770,000 users throughout the region and even in places such as Brazil. These users can read a wide selection of publications through SCOOP - about 600 magazines, 10,000 books and 50 newspapers, says the company CEO Willson Cuaca. This wide selection of publications, together with the large user base, generated for the company revenue of about $600,000 for the 2012 financial year. Mr Cuaca expects the three-year-old company to turn profitable in two years. Like other entrepreneurs in the technology sector, he did not hit paydirt from the get-go. Armed with a computer science degree, he found a job in the network and Internet security sector. In 2008, however, he realised that there were many opportunities in the consumer mobile market - opportunities created with the launch of the iPhone. He built a location-based app called Foyage, which sets out nearby amenities such as malls and restaurants. Foyage did not take off. He says its business model was driven by advertisements, but publishers were unwilling to advertise on such platforms at the time. Undeterred, he incorporated Apps Foundry in 2010 with business partners; angel and venture capital investors financed the company, which develops apps for the Android, iPhone and BlackBerry platforms. Within a year, the company developed more than 40 apps, SCOOP among them. That SCOOP had something special about it was not immediately apparent to Mr Cuaca. He says: "In all honesty, SCOOP was a side project. I never suspected it to be as successful as it currently is." His fortunes changed when SCOOP started gaining traction. It was downloaded more than 25,000 times within three days, and named the top free app on iTunes; in Indonesia, it was the top grossing app. Mr Cuaca then started channelling resources into SCOOP instead of the other apps. So while the company has more than 80 apps to its name today, its principal focus remains SCOOP and its associated apps. SCOOP, like many other apps, is free. The company makes money when users purchase content through SCOOP. This revenue is shared with the publisher of the content. The app features content from publishers in markets such as Indonesia, Singapore, the Philippines and Brazil. Accordingly, much of the content available tends to be specific to the market from which the publisher hails. Examples of such localised content include Indonesian regional newspapers and local versions of magazines such as Men's Health. SCOOP offers publishers a number of value propositions, said Mr Cuaca. First, it is an aggregator of digital content. This lowers user acquisition costs for the publishers. SCOOP's wide stable of publications makes it a one-stop shop for users who wish to read a selection of publications through a single digital platform; this comes from users being more likely to choose to read content through SCOOP, rather than through a number of standalone apps. This is especially so if the publication is a small, indie magazine. Second, SCOOP offers publishers analyses of how their content is consumed. This includes information such as whether the publication was read from start to finish and even whether readers actually read advertisements in the publication. Such information is far more useful to publishers than an analyses of how print media is consumed, which is often limited to circulation numbers; circulation numbers are not sufficiently detailed indicators of consumption patterns, he says. 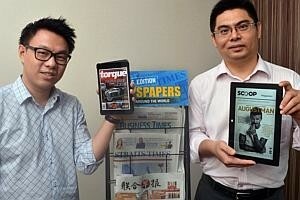 Third, SCOOP enables publishers to reach new markets. Mr Cuaca says the market for media consumption is dichotomous: people generally consume either traditional/print media or digital media, rarely both. The content available on these two platforms is generally different: content available on print media tends to be longer and far more detailed; content available through digital media is crafted to be short, punchy and delivered in real time. Thus, publishers often generate two types of content for the different markets - longer pieces for print, and punchier pieces for digital media. This means they generally cannot not monetise the content they generate for the print market by delivering that to the digital market. SCOOP changed this. Users who previously consumed only digital media content have started buying content that had originally been generated for print media but made available on this app. Fourth, SCOOP has enabled publishers to reach diaspora readers, says Mr Cuaca. For example, it has given Indonesians based overseas access to the content of their regional newspapers. The company faces two primary challenges, he says. First, it is difficult to attract and retain the right talent the company now needs. "The skill to build the company from $0 to $1 million is different from what is needed to grow the company from $1 million to $100 million," he says. The company now needs experienced professionals who know how to take the game to the next level. Unfortunately, these are the very professionals who are difficult to find; it means wooing them away from the security of their current positions in established companies - to join an up-and-coming company such as the Apps Foundry. The second challenge Mr Cuaca has identified is the need to be sensitive to changes in this dynamic market and in consumer preferences. He is convinced that the company's strengths will stand it in good stead, and that it will continue to grow because of its value propositions to publishers. "There is really only the upside for them," he says, noting that publishers do not need to pay any upfront fee. This means they make money if users choose to read their content, but do not lose anything even if users choose not to. Thus far, investors are also convinced the company will succeed. Since its incorporation, Apps Foundry has continued attracting investments. One of these investors is the Kompas Gramedia Group, an Indonesian media conglomerate. It was initially a competitor of the company, but eventually decided to buy into it when it realised that it made sense to do so, says Mr Cuaca. Going forward, the company wants to grow its presence in the Malaysian and Philippine markets through acquisition of more titles. With a growing middle class, such markets present tremendous opportunity for growth, and Apps Foundry is intent on benefiting from this.